To place orders please call 1-855-961-1100 or you can email us at sales@premiumtruckpartsusa.com. 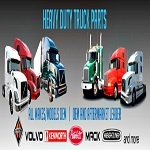 Most orders placed with Premium Truck Parts that are in-stock usually ship same day or next day. Because of this, Premium Truck Parts does not guarantee pre-shipping cancellations on any order’s with in-stock items. Email us at sales@premiumtruckpartsusa.com as soon as possible. Most orders are transmitted almost immediately to our warehouses and we may not be able to cancel your order. Back-ordered items may ship at any time. Because of this, Premium Truck Parts do not guarantee cancellations on any orders containing back order items. However, customers may submit a cancellation request for orders that have back ordered item’s by email sales@premiumtruckpartsusa.com. Please allow 48 hours to ensure order has not shipped. All products sold by Premium Truck Parts are considered new, factory sealed & covered by manufacturer warranties unless obviously specified. If you find your package is not delivered in this condition, please contact us immediately at sales@premiumtruckpartsusa.com. Premium Truck Parts does not offer any technical assistance. We cannot offer advice on compatibility of items. We are not technicians, only quality retailers with competitive prices. Most orders get shipped within 2 to 3 business days upon payment.